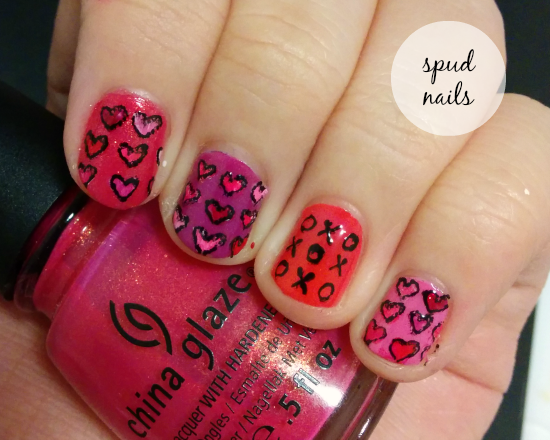 I'm back with Valentine's Day nail art! I think this calls for a round of celebrations. I managed to edit my pictures (tedious work on PicMonkey since I don't have Photoshop installed on this PC), I'm actually posting BEFORE Valentine's Day and this is a fresh design aka I'm still wearing it, haha. 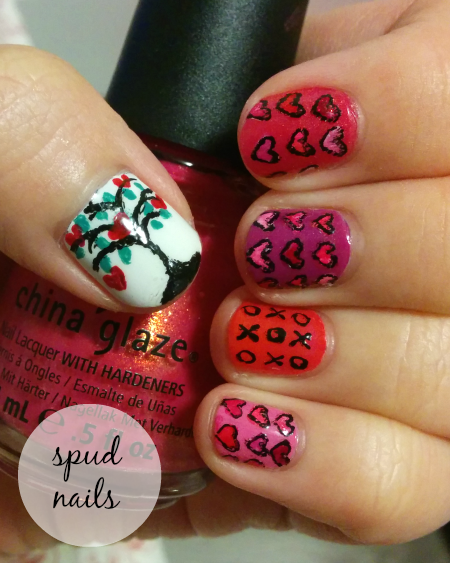 I'm not big on Valentine's Day and wasn't actually going to do any specific design but I've been seeing some V-day nail art contests (?) and decided, what the heck I'll just try to come up with something and if I think it's worthy and if I don't miss the contest entry date, I'll submit my entry. This is the finished look! I love it! It's so me in the sense that it's so pretty yet imperfect. I don't think I could ever claim to be a perfect nail artist since my lines are usually always slightly off and sometimes I make a smudge or two. And that's fine because I've embraced my imperfections to be kind of like my style. I used two coats of each polish as the base. 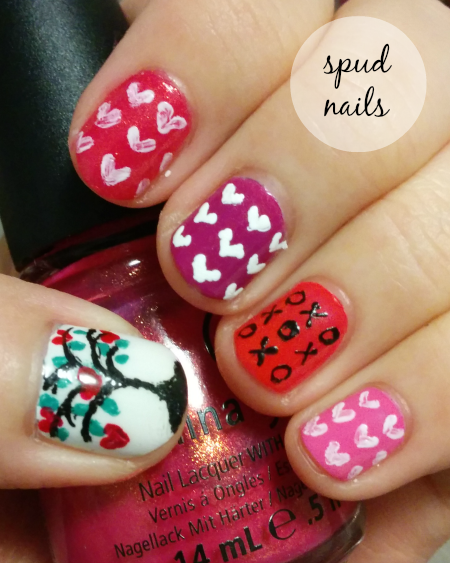 Next, I was inspired by a picture of a tree with hearts hanging off it and decided to draw one on my thumb nail. I have no idea why I left my brown nail polish back home and I was bummed when I realized that. 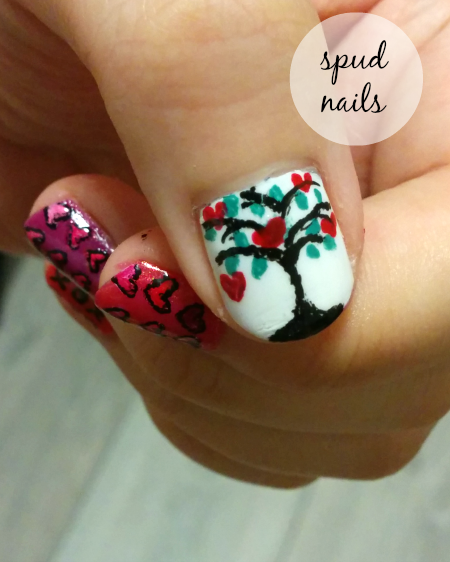 I made do with my black nail art pen as the tree trunk and branches. 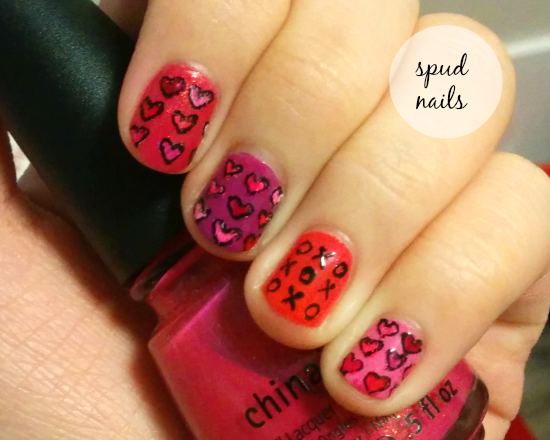 My idea for the other nails was to do rows of hearts and one accent nail with XOXOs on it. I used the black nail art pen to draw the XOs. By now you can already tell that the white hearts on my middle finger are much more prominent. That's because I used my white nail art pen to draw them on. I only wanted the white polish as a base for the colors I was going to paint over it so the pen wasn't such a good idea. The polish flowed out and was rather thick and hard to control so I switched over to China Glaze - White on White and a nail art brush. ... grabbed the black pen again and outlined all the hearts. Granted the outline wasn't as smooth as it should have been but I'm glad I outlined them. Don't they just pop against the base colors? 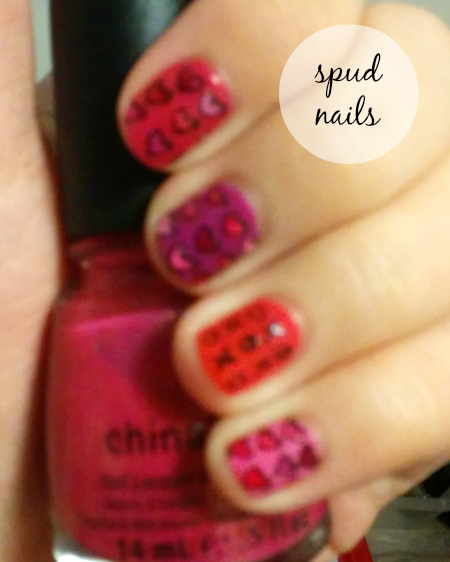 Yup, then I sealed the designs in with top coat and called it a day. And here is my biggest accomplishment yet, haha. 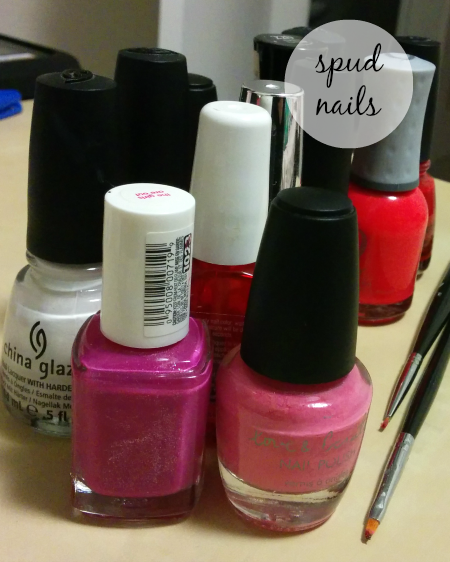 I labeled the polishes in the picture. It took me sooo long to squeeze everything in and align the arrows and stuff but I really wanted to point out the nail polish bottles behind. 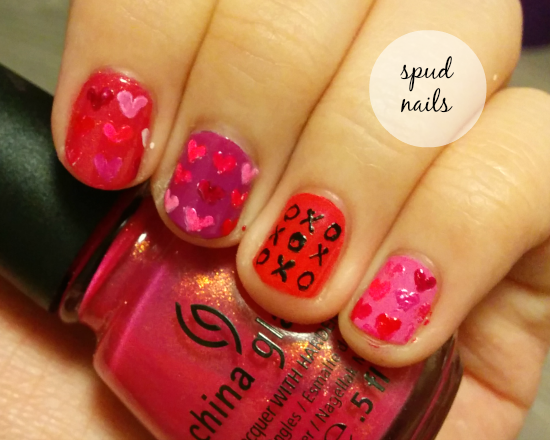 I only labeled the red and pink polishes, all of which I used to color the rows of hearts. 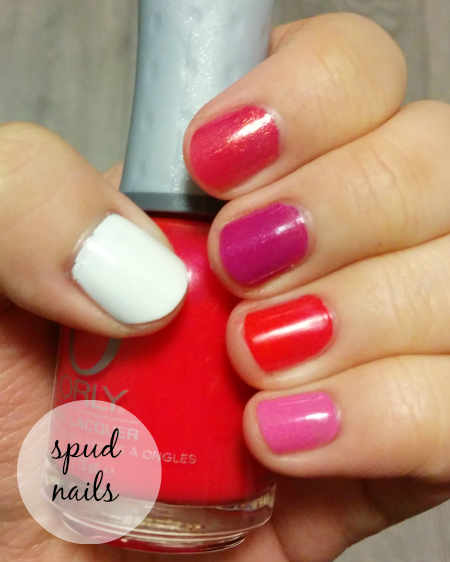 The rest are my base coat, top coat, Orly - Liquid Vinyl and China Glaze - White on White. Oh, and those are the two brushes I used for the entire design. Here's a better picture of Essie - The Girls Are Out and Love & Beauty - pink. 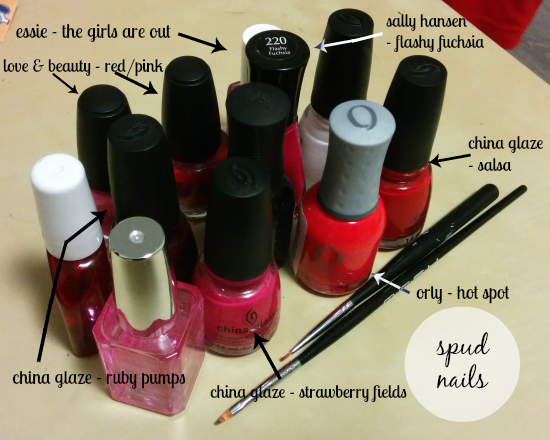 I had no idea I had so many red/pink polishes. I initially started out with ONE red polish, thinking I wouldn't buy any other reds... Who was I kidding? And here's a shot of blurry heart-shaped goodness. This design actually reminds me of a notebook I used to have when I was younger. It was by Happy House and just the cutest notebook with rows of multi-colored hearts. How will you be celebrating Valentine's Day? Is it a big deal for you or do you just let it slide by? P.S: All pictures taken with my phone and inside the house.